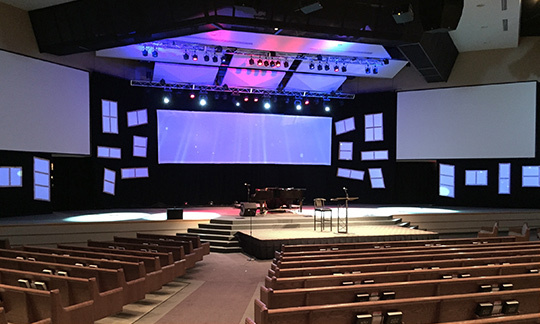 Our audiovisual design consultants provide independent, expert audio visual design services to optimally integrate audio visual systems with church and worship center acoustics—so speech, sound, music, and visual media are delivered with acoustical and visual clarity and brilliance. We consult with church and worship center music and technology directors, worship committees, clergy, and other stakeholders to specify audio visual technologies and applications that work together in a unified, integrated system. Our AV design solutions offer end-to-end audio visual systems that help deliver a rich and inspiring worship experience. ABD Engineering and Design also offers expert architectural acoustics solutions. We consult in both the design phase for new facilities, as well as existing facilities, to shape and design spaces for optimal acoustical performance. With architectural acoustics and AV systems design expertise, we offer comprehensive acoustical engineering and design solutions for church and worship facilities.